From our new Border Tiffany lamp range. 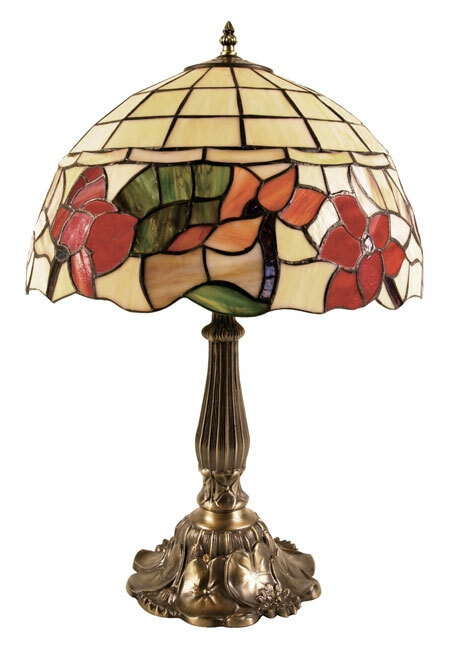 Beautiful Tiffany lamp range in neutral colours with deep border of vivid red floral displays. The neutral base colour is a blend of warm cream tones whilst the deep scalloped edge border creates the perfect contrast colours with red creating the theme colour and shades of greens and dusty pink. The medium 300mm Tiffany table lamp has a base of cast antique brass. Please note: The design of this table lamp has changed slightly. There are now two bands of cream glass at the top of the lamp and not three as shown in the picture. A picture showing the new design will be updated as soon as it becomes available.